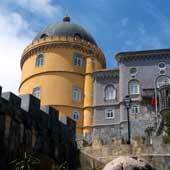 Sintra is nestled within the pine covered hills of the Serra de Sintra. This slightly cooler climate encouraged the Portuguese royalty to construct their palaces and castle within the vicinity of the town. Sintra contains varied palaces, castles and grand houses, all of which are uniquely styled and built. Cascais is known to as “The Town of Kings and Fishes” because it was a small fishing town that found favour with the 19th century Portuguese nobility, who came here for their summer retreat. Thanks to this fact, the town is uncommonly rich in beautiful architecture, free museums and carefully maintained parks, on top of which, it’s surrounded by a varied coastline of impressive cliffs and beautiful, intimate sandy coves. 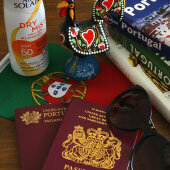 Sintra or Cascais, for a Day Trip? Sintra is the recommended first day trip from Lisbon, and if there is sufficient time Cascais should be the second day trip. 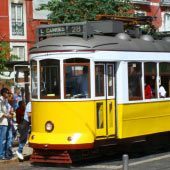 The suggested order for day trips from Lisbon is: Sintra, Cascais, Cristo Rei Statue (and Costa Caparica), Obidos, Sesimbra(and the Arrabida National Park), Mafra and Evora. Sintra is a great day trip from Lisbon; there are multiple fascinating palaces, a delightful town centre and challenging hiking trails. 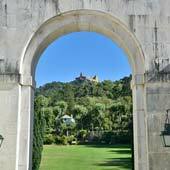 In a typical day trip to Sintra most tourists visit the National Palace, Moors Castle and the Pena Palace – for a guide to a Sintra day trip please click here. All of the sights of Sintra are connected by a tourist bus service and is almost essential as the Pena place is high up in the hills of the Serra de Sintra. Cascais has less grand or important monuments than Sintra but still is an enjoyable day trip from Lisbon. Cascais is a traditional fishing town that boasts a selection of unique 19th century residences and stately homes. 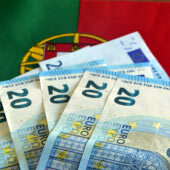 Also contained within Cascais are a selection of informative museum and free art galleries. The Boca do Inferno cliff formation is just to the north of Cascais while there are sandy beaches to the east. 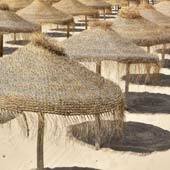 For a holiday of more than three days, our recommendation to visitors is to be based in Cascais rather than Sintra. To start with, Cascais has a better range of tourist facilities than Sintra, with a larger selection of restaurants, shops and bars. Cascais has also the advantage of being close to a series of fantastic beaches, including both the exciting surfing beach of Guincho and the popular, paradise-like beach of Carcavelos. As Cascais and Estoril (the neighbouring town) are designed as holiday destinations, they both offer a larger choice of hotels than Sintra. 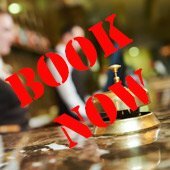 Tourists commonly only stay one or two nights in Sintra and use the hotel as a base for exploring the town and immediate vicinity. You’ll typically need one day to visit the Pena Palace, the Moors Castle and the National Palace, while a second day is required to visit the Monserrate Palace, the Quinta da Regaleira and the Convento dos Capuchos. You may consider spending a third day pleasantly hiking along one of the many trails of the Serra de Sintra, or else catch the tram (summer only) to the wonderful Praia das Macas. The restaurants and bars in Sintra tend to be more tourist-focused (and thus expensive) than in Cascais, and there is a smaller selection to choose from. 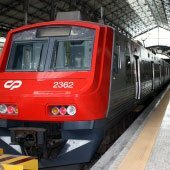 There are regular train services between Lisbon-Sintra and Lisbon-Cascais and the capital can be easily visited from both towns. 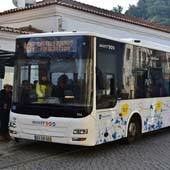 A direct bus connects Sintra to Cascais so staying in either town does not exclude visiting the other. 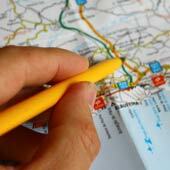 Sintra or Cascais for Hiking or Cycling? The walking routes in Cascais are much easier and suitable for visitors of all ages. The coastal promenade from Cascais to Estoril is a popular walk of 3km that follows the beaches and sea defences of the Cascais coastline. There is a second shorter walk from Cascais to the Boca de Inferno cliff formation. A purpose built cycle path cycle path connects Cascais to the surfing beach of Guincho. This is an excellent cycling route which is 9km (18km return journey) and follows the N247 road west from Cascais, where free bikes can be hired in exchange of an ID.